Edmund Burke wrote that "government is a contrivance of human wisdom to provide for human wants". (1) Governments have a wide range of possible actions. Governments establish rules. Governments set the rules by which they and other organisations (like companies or charities) operate. Governments coerce. Governments can prohibit action (such as child abuse), or require some forms of action (such as sending children to school). Governments provide or purchase services. Provision means that states provide services themselves. Public housing, national health services or state education are examples. Purchasing services implies that the state accepts responsibility for ensuring provision, but that the service can be obtained from another agency. Governments subsidise. Subsidy consists of a financial inducement to act in a particular way, which may be a reward for doing things (e.g. increasing employment), a form of compensation , or an incentive to do things. Tax can be used in the opposite direction, as a negative subsidy - e.g. to deter people from smoking. Governments persuade. Examples are propaganda, exhortation and directed education. Governments plan. Governments 'steer' a society by watching and adjusting policy. Governments produce. Like independent organisations, governments may offer services to customers - e.g. insurance, banking or commercial production. There is no rule which says that government activity has to be tax-based or financed. Political views on welfare are often divided into 'left' and 'right' wing views. The positions people hold are not, however, straightforward. There is an individualistic left wing, and a collectivist right wing. Left-wingers favour social security (which enable people to buy food in the private market) rather than soup kitchens (which can be publicly provided). Many right-wingers accept the principle of institutional welfare, and many left wingers are uncomfortable about institutional measures, like earnings-related pensions or student grants, which favour richer people over poorer ones. Marxists see society in terms of a conflict between economic classes. A dominant class (the bourgeoisie or 'capitalist' class) owns and controls the means of production; an industrial working class, the 'proletariat', is exploited by them. Communism was based on Marx's claim that the proletariat must revolt to throw over the old economic order. The Marxist analysis of welfare concentrates principally on its relationship to the exercise of power. The state can be seen either as an instrument of the ruling capitalist class, or as a complex set of systems which reflects the contradictions of the society it is part of. It is often argued that welfare has been developed through the strength of working-class resistance to exploitation. Marxism is not a single doctrine; it has come to stand for a wide range of opinions within an analytical framework that is critical of 'capitalist' society. Neo-marxists argue that the state has two main functions. The first is to improve the conditions for the accumulation of capital - that is, the chance for industries to make profits. The second is to legitimate the capitalist system, by introducing measures (like welfare policies, pensions and health services) which lead people to accept the system as it stands. The requirements of accumulation and legitimation may be contradictory, and the costs of legitimation have led to a 'legitimation crisis'. The basic objections to marxist analyses are that the description of 'capitalism' is false - the patterns of inequality and the structure of power are far more complex, and the organisation of economic production has long ceased to reflect formal ownership. Power in society is divided, and governments are among the actors. States which promote the welfare of their citizens are not pretending to be more legitimate - they are more legitimate. Socialism is confused with Marxism and communism in many texts (and by Wikipedia, which makes the same mistake). Marxism was a prominent form of socialism in the early 20th century, but there were socialists before Marx, and Marxism is irrelevant to much of the mainstream. Socialism in Europe grew from a range of religious, occupational and communal groups. Historically, socialism is strongly associated with working-class movements, and in much of Europe 'socialist' issues are closely linked with labour relations. The socialist group in the European Union identifies its role in terms of socialist values and principles rather than an ideal model of society. The key socialist values are 'liberty, equality, and fraternity'. Some socialists would add to that issues of rights and democracy. Liberty. Although many socialists refer to freedom as a basic right, liberty needs to be understood in social terms. Socialism calls for people to be enabled to do things through collective action, a principle sometimes referred to as empowerment'. This principle has been central to 'guild socialism' and trades unionism. Equality. Socialism is egalitarian, in the sense that socialists are committed to the reduction or removal of disadvantages which arise in society. The 'Fabian' tradition, a reformist movement, attempted to achieve greater equality through spending on social services. Fraternity. Socialism is collectivist: people have to be understood in social context, rather than as individuals. Socialism is often represented in Europe in terms of 'solidarity', which means not just standing shoulder-to-shoulder but the creation of systems of mutual aid and support. Social democracy depends, like socialism, on the values of liberty, equality and fraternity (or solidarity). This is fused with a model of liberal democracy, based on rights. The differences between social democrats and socialists are hazy, because their ideals may coincide in some aspects and not in others, but two are particularly important. First, many social democrats are individualists rather than collectivists; even if they accept arguments for mutual aid or the reduction of disadvantage, they think it important to stress the liberty of the individual, to develop individual rights (as liberals do), and often to restrict the role of the state. Second, some social democrats are not concerned to remove inequality, but only to mitigate its effects through social arrangements which protect people from the worst consequences of a market society. Others favour equality of opportunity, which implies the opportunity to be unequal. Conservatives believe in the importance of social order. This is reflected in a respect for tradition, an emphasis on the importance of religion, and a stress on the importance of inequality - such as inequalities of class or caste - as the basis for structured social relationships. Welfare is a secondary issue, but the kinds of concerns which conservatives have are likely to impose restraints on welfare, with a particular emphasis on traditional values in work, the family, and nationhood. Welfare does raise concern where it is seen to have implications for public order - one British conservative commented, in commending the Beveridge report, that "if you do not give the people social reform they are going to give you revolution." Christian democratic thought is closely related to conservatism, but it also has important distinguishing features. Like conservatives, Christian Democrats place a strong emphasis on order; but order is to be achieved, not primarily through state action, but by moral restraints. These moral restraints have principally in Europe reflected the influence of the Catholic religion. Catholic social teaching has emphasised both the limits of the state and the responsibility of people in families and communities for each other; christian democrats tend, then, to favour limitations in the role of the state while at the same time accepting moral responsibility for social welfare. In the United States, the term 'liberal' is often taken to refer to social democrats and the political left. In the rest of the world, and in most of the academic literature, a 'liberal' is someone who holds a set of liberal values. Liberalism begins from the premise that everyone is an individual, and that individuals have rights. The central value of liberal individualism is freedom. All freedoms are not equally important; the main liberal values are concerned with certain particularly important freedoms, such as freedom of assembly, of speech, and of worship. Liberals mistrust the state and argue that society is likely to regulate itself if state interference is removed. Hayek argues that all state activity, whatever its intentions, is liable to undermine the freedom of the individual; that society is too complex to be tampered with; and that the activities of the free market, which is nothing more than the sum total of activities of many individuals, constitute the best protection of the rights of each individual. As a political position, liberalism has been important as a means of defending people from abuse by authority. Although liberalism was initially a radical doctrine, it has also been used since the 19th century to stand for a defence of propertied interests. The 'conservatives' of the New Right are generally liberal individualists rather than conservatives. They are sometimes also called neo-liberals, because they combine the focus of the traditional market liberals with a degree of conservative scepticism about human behaviour and motives. Populism has been described as "an ideology which pits a virtuous and homogeneous people against a set of elites and dangerous ‘others’ who are together depicted as depriving (or attempting to deprive) the sovereign people of their rights, values, prosperity, identity and voice." (2) This is as much a description of a style of political argument, on both left and right of politics, as it is of any distinctive political position. Populism is often seen as a reaction against social change, appealing particularly to people who feel their position is threatened by it. Populism is based on a view of 'the people' as sharing views and interests, and able to exercise a common 'general will' (typically interpreted by a charismatic leader). The French Front National, for example, claims to run "in the name of the people". The populist approach to democracy is liable to be exclusive. Populist parties may be prepared to support welfare provision for 'the people', but they may be suspicious of welfare for outsiders and immigrants. The picture advertises provision formerly made in a French town led by a National Front mayor, offering a bonus payment for French families only. The measure was subsequently declared illegal. A rally of British fascists in 1939. Fascism is often represented in the academic literature as a pseudo-ideology, lacking any coherence or system of thought. This was a political position taken post-war in an attempt to deny the romantic and emotional appeal of fascist thought. Fascist ideology is based in an authoritarian collectivism. The individual is meaningless; the collectivity (the state, the nation or the race) is paramount. Fascism has been characterised by a strong social agenda; in Nazi Germany, the desire to foster racial supremacy included extensive state intervention in society and the economy, with a stress on socialisation (both through schooling and youth movements) and eugenic policies. Eugenic ideologies existed before fascism, and although they were discredited by their association with medical murder and the holocaust they have resurfaced in recent years. They are characterised by the nineteenth-century belief that socially constructed characteristics, like poverty, crime or sexuality are inborn, and that they will inevitably find a way to emerge unless breeding is regulated. Repeated attempts in social science have found no empirical support for the belief that such characteristics are replicated between generations. The extreme right in Europe is mainly racialist and nationalist rather than collectivist. In Greece, however, Golden Dawn has adopted an authoritarian, collectivist ideology referring directly to fascist tropes. wants - the things which people choose for themselves. Despite the ambiguity; some generalisations are possible: in each sense, poverty can be identified with a lack of well-being. 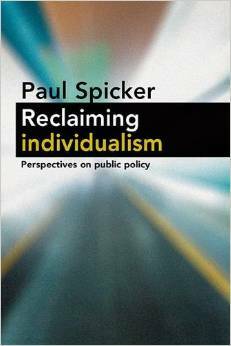 Individualists (and economists) define well-being as a property of 'individuals'. Social well-being is the interests of people in groups, which is not always the same as the people within it; there are often conflicts between the interests of individuals, families and communities. For example, it is generally considered to be in the interests of a nation to defend itself against attack, even where people within it suffer directly as a result. Individual and social welfare coincide because people are interdependent, social creatures, and people rely on social mechanisms (like social interaction, exchange, the division of labour, and education) for their personal development and well-being. The basis of solidarity is mutual obligation. This is mainly expressed through reciprocity, or exchange. "Balanced reciprocity" occurs where people make a direct return for the things they receive. Often, though, reciprocity is "generalized"; there is no simple balance, but people give because they have received something in the past, or because some future reciprocity is possible. For example, parents give to children because their own parents gave to them; people support pensioners in the expectation that future generations will support them when they are pensioners. Generalized reciprocity is the norm within families, but it also occurs in mutual insurance. Solidarity can be difficult to distinguish from 'altruism', but there is no reason to suppose that the motivation is unselfish. The central problem of solidarity is that it is often exclusive - confined to a special group. Rights are rules: they can protect liberties or impose duties on other people. Moral rights are rights which are backed by a moral claim; legal rights are backed by a legal sanction. Rights to welfare can be general (applying to everyone) or particular (applying, like contractual rights, only to specific people). The welfare states of continental Europe have mainly developed particular rights, related to membership of schemes and individual rights; this has proved a very effective way of promoting social protection, most notably in the area of pensions, but it does not necessarily extend to the whole population. The model followed by the UK attempted to extend rights to everyone, on the basis of citizenship. Citizenship is the right to have rights. T H Marshall called citizenship as 'a status bestowed on those who are full members of a community.' (4) This idea, like solidarity, can be exclusive; it can be used to deny people rights, as well as to include them. Human rights are a further class of general rights, which apply to everyone, regardless of whether they belong to a political community. Several international organisations, including the United Nations and the Council of Europe, promote human rights beyond citizenship. The UN's Guiding principles on extreme poverty and human rights treat poverty as a violation of human rights. There are two main approaches to justice. The Platonic idea sees justice as what is good, right or desirable. (5) John Rawls, for example, asserts that freedom is part of justice. (6) The Scottish Government's plan for a Fairer Scotland includes commitments to superfast broadband, oral health, measures to stop bullying in schools and programmes to help lonely old people. (7) These are all good things, arrived at by asking people what matters; if justice is about what makes for a good life, then anything might be part of justice. The Aristotelian view sees justice as a principle of proportionate action. (8) Social justice is basically a distributive principle: it concerns the proportions in which people should contribute to and receive things from society. Corrective justice means that the punishment should fit the crime; distributive justice means that people should have fair shares. Justice begins with a presumption of equality; people should not be treated differently without a reason. There may, though, be many reasons. The criteria which have been proposed as the basis for distribution are complex: they have included need, desert, contribution to society, hereditary status, and many others. positive - people must be able to act. Individualists argue for a model of freedom where people's freedom depends on their independence. Social welfare and state intervention are seen as undermining independence, and so freedom. A social model of freedom begins from the view that freedom depends on interdependence. To be able to act, people have to have the power to choose in society. In this model, poverty negates freedom. Social welfare empowers people and enhances their freedom. a system of decision-making. 'Participative' or 'direct' democracy gives decisions to the people who are affected by them. a society where people have rights. 'Liberal democracy' accepts majority voting only because a majority is made by the agreement of a collection of minorities. The state is a general term for the institutions, agencies and procedures related to government. 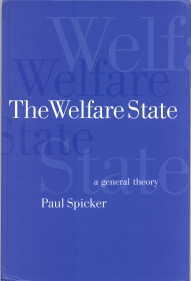 The idea of the 'welfare state' suggests that social policy is mainly a governmental responsibility, though in practice many of the functions of welfare states are undertaken by agencies beyond the government. If governments are concerned about the welfare of their citizens (some are not), they will have some responsibility for social protection. This responsibility may be residual (confined to those who are unable to manage in other ways), but most states have found that it is impossible in practice to confine their actions only to support in the last resort (the model of the Poor Law). The reasons are partly administrative (strict selectivity is costly and inefficient), but mainly political: the pressures for expansion are irresistible. The welfare states are institutional forms of social protection, where the state has come to set the terms on which social protection is delivered. Some writers have argued that states should confine themselves to a more limited range of activity, but if the same activities can legitimately be undertaken by non-state agencies it is difficult to see why they cease to be legitimate if a properly constituted government does them. "Religion" is not the same thing as faith or belief, though faith may be required in some religions. Religion is a pattern of social organisation, and as such it can be distinguished from the teachings of prophets or scripture. As a pattern of organisation, religious practice has important implications for social policy. The first dimension of religious influence is based in moral teaching. Many religions offer guides to morality, but there may be several strands of moral belief which co-exist. Universalism is the view that the same principles apply to everyone. Communitarianism states that we have special responsibilities to some people (such as family members), and that our moral duties define how close we are to others. Many religious institutions - such as charities or waqfs - are founded on a communal basis. Individualism argues that each person is responsible for his or her own actions. There is no necessary inconsistency between these principles, but different balances imply different social policies. A second dimension of religious teaching lies in the extent to which religion is integrated with political institutions. Some religions, and some countries, have made a firm distinction between the secular and religious spheres of their societies - there are examples in Catholic France or the predominantly Protestant USA. Others have established religions and churches, including the formally Christian United Kingdom, the Jewish state of Israel or the Islamic Republics of Iran or Pakistan. Some religious groups are radical, arguing for fundamental political and social change; others are conservative, arguing either for support for established regimes or at least acceptance of the status quo. Understanding the role of religious values in social policy often depends, then, on the interplay of these different dimensions - moral responsibility, political orientation and identity. So, for example, the primary issues in the USA lie in the tension between individualist and communitarian interpretations of religious principle; in Turkey they fall between secularism and political Islamism; in much of Africa and South East Asia, they are often based in ethnicity. E Burke, 1790, Reflections on the Revolution in France. cited in N Coote, 1989, Catholic Social Teaching, Social Policy and Administration 23(2) 150-60. T H Marshall, 1963, Sociology at the crossroads, Heinemann. J Rawls, 1971, A Theory of justice, Oxford University Press. G MacCallum, 1967, Negative and positive freedom, Philosophical Review 76 312-324. J Schumpeter, 1943, Capitalism, Socialism and Democracy. Allen and Unwin. J Dreze, A Sen, 1989, Hunger and public action, Oxford University Press. J Haynes, 1995, Religion, fundamentalism and ethnicity, Geneva: UNRISID . Principles of Social Welfare is now available as a free e-book, published on a Creative Commons licence.